Hi my name is Lauren and I have a phobia of Sloths. So to answer one of my prompts for the Spooks and Tea readathon I picked up Slothilda. 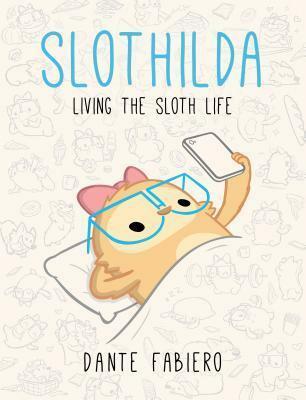 Slothilda follows a character of the same name with her lil puppy as she sloths about her life. Honestly if you don’t get really scared by sloths you’re gonna love this little collection of comics and its relatable humour. You’ll read it and be like “MOOD”. The art work definitely fits the style as its mostly just Slothilda and her puppo that are in colour; her actions are always over the top. You can read this in one sitting, in like 10 minutes. Its very simple and I think most people will say its cute too. The book itself is broke into different sections about different day to day life and it’ll get you to reflect a fair bit on your own actions. Maybe you too are a bit too slothlike? Pick it up if you want and you adore sloths but for me its a no because its sloths and because its a very short read. HOW CAN YOU NOT LIKE SLOTHS? They are so….. soooooo….sooo sloths!!! That is true, but they are so slow it’s never gonna happen! Plus look at that silly face! I LOVE Sloths, definitely going to check it out!! This sounds adorable and I absolutely love sloths, so I’m definitely going to need to check it out! Did it help you with your sloth phobia?